We are waiting for you on Sunday, July 29th for the event “The lost music of Etruscans”, organized in collaboration with Musei di Maremma, the ATI Guide di Maremma and the Pro Loco Alborensis. 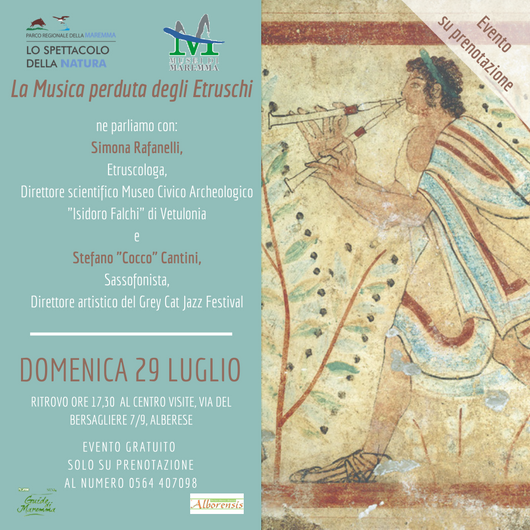 A unique event to learn about the music of the Etruscans through the words of Simona Rafanelli, Etruscologist and Scientific Director of the “Isidoro Falchi” Civic Archaeological Museum in Vetulonia and the music of Stefano “Cocco” Cantini, Saxophonist and Artistic Director of the Gray Cat Jazz Festival. The meeting is scheduled at the Visitor Center at 5.30 pm and then we will move together on the itinerary A6, where the event will take place. The event is free, but booking is mandatory, by contacting the visitor center at +39 0564 407098, open every day from 8.30 am to 8 pm.